Trailhead and parking area are at the end of Lower Doetown Road in Rumney, NH. Take Main Street from Rt. 25, 3.3 miles west of Rt. 3A and 4.1 miles east of Rt. 118. In one mile, bear left onto Stinson Lake Road. Contine four miles, then turn right onto Cross Road. Go 0.8 miles and turn right onto Lower Doetown Road. Proceed 0.3 miles to the parking area. Head out on Stinson Mountain Trail. In 0.9 miles, a snowmobile trail comes in from the right. 0.2 miles past this, bear right where the snowmobile trail continues straight. Continue 0.7 miles to the summit. 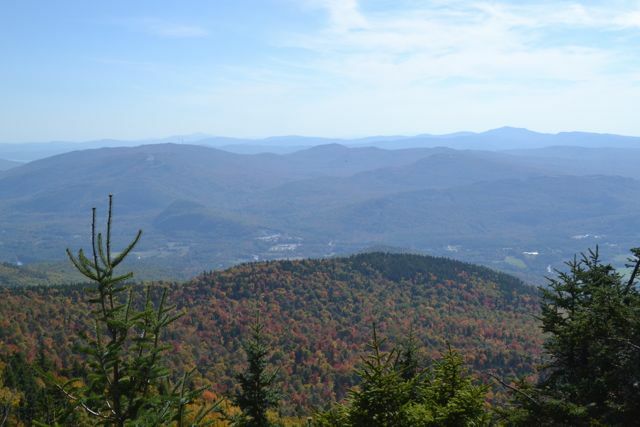 At the southern tip of the White Mountain National Forest stands Stinson Mountain, once the site of a fire tower. Part of an unnamed range of low, rolling mountains, it is just under 3000 feet in elevation and has a rocky summit with directional views to the south. Begin your hike on Stinson Mountain Trail. The trail heads into the forest and begins ascending gradually, slowly steepening as it goes up. After 0.9 miles, a snowmobile trail joins the hiking trail from the right, but diverges left in 0.2 miles. The trail becomes steeper quickly after and begins to ascend by switchbacks. The grade eases near the top, and just below the summit, the trail rejoins the snowmobile trail. It ends at the small rocky summit 0.9 miles from the first snowmobile trail intersection. The fire tower footings surround the highest point. The clearing provides a good directional view south. Mt. Cardigan is visible in the distance, and the town of Plymouth is visible up close. You can also see into Vermont to the west. A spur path leads to a view over Stinson Lake.